Review by AllTheBestFights.com: 2018-04-21, some good exchanges between Carl Frampton and Nonito Donaire but it is not enough to get three stars: it gets two. The former world champion in two different weight classes Carl Frampton entered this fight with a professional record of 24-1-0 (14 knockouts) and he is ranked as the No.2 featherweight in the world. Between 2016 and 2017 he faced current #1 Fw Leo Santa Cruz defeating the Mexican in their first bout (Santa Cruz vs Frampton I) and losing the rematch (Frampton vs Santa Cruz II); after this fight he has beat Horacio Garcia (Carl Frampton vs Horacio Garcia). His opponent, the former world champion in three different weight classes Nonito Donaire, has a boxing record of 38-4-0 (24 knockouts) and he entered as the No.10 in the same weight class. He lost to Jessie Magdaleno in 2016 (controversial decision, Donaire vs Magdaleno) but he came back to win in 2017 with Ruben Garcia Hernandez (Nonito Donaire vs Ruben Garcia Hernandez). 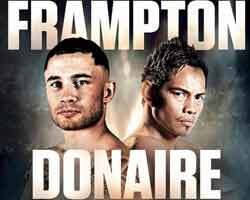 Frampton vs Donaire is valid for the interim WBO World featherweight title. Watch the video and rate this fight!